Tangled may not end up with the endearing reputation of something like Snow White, or Pinocchio, but in a genre that sees far too much pandering and not enough invention and innovation, this wonderful film has both to spare. 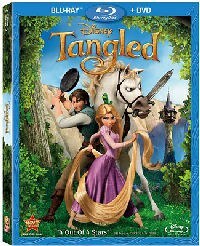 Disney is touting its latest animated feature, Tangled, as it's milestone-in-the-making 50th such achievement. Of course, there's a classicism that comes with such a tag that the studio might struggle achieving honestly. After all, when you are incorporating lesser product such as The Aristocats, Brother Bear, and Chicken Little into the vaunted mix (not to mention almost features like Make Mine Music and Melody Time), you're pushing the boundaries of your bellwether. Even worse, Tangled came into being under the guise of several restrictions, including a new House of Mouse mandate that the movie would be their last "fairytale princess effort" for the foreseeable future. When you consider Walt and the guys made their name with Snow White, Sleeping Beauty, and Cinderella, such a strategy seems insane. There were other potential problems as well. The original title - Rapunzel and then Rapunzel, Unbraided -was deemed "not boy friendly" enough, and a new name was quickly cobbled together. Then there was the cost. At more the $260 million (yes, you read that right) and six years in development, the CG styled effort was hemorrhaging cash. It need to be a monster success, less it throw the company into complete disrepair. There were reputations and financial realities on the line, imperative had Tangled (new to DVD and Blu-ray) been a bomb, a beleaguered Mars Needs Moms that fails in almost every element it attempts. Instead, it turns out to be one of the studios very best, a zany, zippy companion piece to other precious post-modern jewels as The Little Mermaid and Beauty and the Beast. While it didn't earn an Oscar nomination for Best Animated Feature (and it definitely deserved one), it did become one of the company's most successful films ever. The set-up sees the King and Queen of a tiny kingdom expecting their first child. When her majesty grows ill, soldiers are sent out to find a magical flower, a plant blossoming with the very life-giving forces of the sun itself. Closely guarded by an angry witch named Mother Gothel (Donna Murphy), its loss drives the sorceress to kidnap the royal child. Raising it as her own and calling it Rapunzel (Mandy Moore), she discovers that the growing girl's hair now holds the power of healing and immortality. Locked in a secret tower and told of the horrors in the real world, our heroine grows up sheltered but secretly dreaming. She wants to escape and see the distant lights that arrive once a year...on her birthday. As luck would have it, a rogue thief named Flynn Rider (Zachary Levi) stumbles upon her predicament. Desperate to see the dream come true, she makes a deal with the cad. Of course, when Mother Gothel discovers what has happened, she plots to get back what is "hers", no matter the cost. Directed with a lively spirit and sprinkled with a compelling cast of sublime supporting characters, Tangled is indeed a charmer. It rallies all the previous Disney designs and approaches to create a witty, winning entertainment with just enough contemporary spin to keep the somewhat cynical demo in check. With a merry musical score and sunny voice work, the film feels like a throwback, and yet it utilizes the latest technological advances (computer generated imagery, 3D when it hit theaters) to argue for a more updated ideal. Of course we have the cute little critters (the scowling chameleon Pascal, the heroic horse Maximus), the misunderstood baddies (the Stabbington Brothers, the clientele of the The Snuggly Duckling pub), the main villain, and the various players destined to live happily ever after. But they all come together to expertly serve the entire story, not just random parts of it. We never really fear for the outcome, though directors Nathan Greno and Byron Howard do occasionally turn things dark and foreboding. Tangled is more about the adventure and less about the finale. As a lead, Rapunzel is ditzy yet directly in tune with what she wants out of life. Tired of being her "mother's" pet, she yearns for a place outside her prison. On the other hand, Flynn is a false criminal, a guy just looking for his own purpose beyond his brutal upbringing. There are hints at the potential horrors involved, Gothel's skeletal facade frequently coming to the fore before a simple song restores her beauty, and there is a mid-act dam collapse that bests many a mainstream action movie. Yet as with most animated films, it's about character and circumstance, and Tangled delivers in both regards. We are stunned with Mother catches up with her escapee halfway through, quizzical when certain formulaic plot patterns don't automatically fall into place. The screenplay, by Dan Fogelman, avoids much of the unpleasant Shrek style of humor, adding limited pop culture keynotes to otherwise strong three dimensional personalities. Sure, one does have to suspend their disbelief a bit to accept an entire felonious fellowship full of closeted dreamers (their song is hilarious, though), and Gothel can't compete with traditional House of Mouse miscreants like Maleficent or Cruella de Vil. Still, Tangled knows it won't be your older sibling's cartoon companion, and goes out of its way to blaze its own amusing trail. So, oddly enough, Disney wasn't being presumptuous in preparing to give Tangled its half-century congratulations. Sure, some of its past efforts have been sores in the side of the occasionally stunted studio (remember when Home of the Brave was going to be its last 2D pen and ink presentation...ever! ), and the House of Mouse is never what one would call consistent, but when it focuses on a goal, when it goes all out in an effort to recapture the magic that once seemed to come so easily, the results speak volumes for the talents involved. Tangled may not end up with the endearing reputation of something like Snow White, or Pinocchio, but in a genre that sees far too much pandering and not enough invention and innovation, this wonderful film has both to spare. The studio's best? Perhaps not. Disney doing what only Disney can do? Absolutely.